Part Four of Gemma Cleanslate's "The Kids of Second Life"
My whole decision to get a second life began, when I read a Wikipedia article about the Otherland Books by Tad Williams. There was a reference to a Second Life (TM) article on Wikipedia and I am always curious, so I looked at it and got amazed. Since I listened to the audio-play of the books I imagined how it would be to be one of the kids living inside the "Old Mill". When I noticed that there is a possibility to be a kid and to relive a childhood I didnt really have, I used my chance and registered. The first day I logged in i felt pretty much left alone - there weren't any SL-Mentors at that time, that programme started later on. So I roamed over SL to find what I actually was looking for, a place where SL-Kids would meet. The first place I finally met any SL-Kid at was at Auburn Hills Nature Preserve - a beautiful place on about a Quarter-Sim, that was lead by Phoenix Ripley. He was a funny guy who always had an open ear and a cheer up for everyone who needed it. Sadly phoenix died in October 2007 and the place is gone meanwhile, but that's another story. The first SL-Kid I ever met was Verena, a German girl and we could sit at Auburn Hills for hours and talk about all silly things. One day she asked me if I wanted to come to the Vortex Kids Club to dance and I agreed. When we got there, I simply was amazed. Bunches of Kids and many I friended at that day. It was not much later after that day, when someone told me to try one or two adoption agencies to find some parents. So i started a search and found B&R, a small agency which had a nice atmosphere and which I really liked. There, I experienced my first miracle in SL. I was just done with my Kid Application form and sent it to the staff, when she said that she would have just the parents I imagined. 5 minutes later I left the adoption agency at the hand of a beautiful woman - Connie, my SL-mum now already for over 3 years! In the following time I met a lot of SL Children, became a Child Recruiter for SLC,started my own business, got involved in the Hogwarts Reborn RP community, started fishing (thanks to Arianna Pinkerton, whom I freinded at my first day at the Vortex as well), built up my RC Racing Circuits, got more involved by DJing etc. A year and a half later I had the honour to become a manager for one of the greatest vehicle creators in SL, Apolon Obscure. I didn't ask for it, but I annoyed him so much about customer requests, that he told me to come over to his workshop and do it myself. When i was done with my first Helicopter, he told me that I did better than he expected me to and asked me to become his custom manager. I felt really honoured about that and agreed. Since then we were making a lot of things and I more than once drove him up the wall with my ideas, but I love the job a lot and in the following year I learned even more to texture, save prims, sculpting etc. Another honour I had was to DJ at SL6B and Burning Life 2008/09. While BL08 and SL6B were pretty cool and I DJed for Marianne Mccann's Inner Child Camp solely. Burning Life 09 was an experience of a much greater dimension. I DJed about a dozen sets (including fill-ins for the Vortex) within 10 days and shot a lot of pictures. It was awesome to ride all over the sims and to see all the awesome builds creators did. 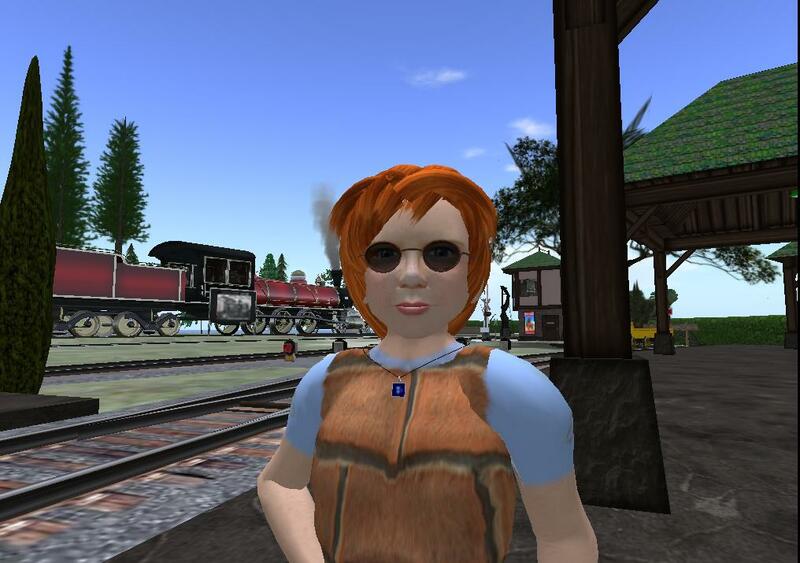 In January 2010 I had the honour to meet the first SL-Children and SL-Friends in RL while i was in the UK. Gemini, Myrtil, PJ and Matt! It only added to our friendship, at least in my eyes, although I wouldn't mind to have more time for them, but that will come. I am sure of that. In May 2010 I got involved in 2 new Projects - the Virtual Railroad Consortium (VRC) and the United Aeronautic Republic (UAR). While in the VRC i will try to help to smoothen trafficking Problems on the SL railroads - I am an apprenticed railroad worker RL so i know a bit about that stuff (grin), in the UAR I will try to fulfill a dream I had since my earliest days in SL - to fly without borders or limitations. So I am now looking forward of what the future may bring. One thing I am planning is to build at BL10. If you want to help me about it, you are welcome to IM me anytime.